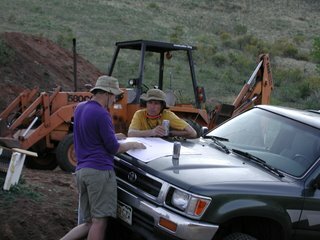 It has been so long since much outdoor work has been done, when the weather cooperated Jeff and Eric went crazy. The were able to finish the roof and begin on the front porch. If you remember, we used SIP (structurally insulating panels) for the roof and covering them with standing metal seam. There are many colors you can get in the metal, but we decided to use steel that will rust over time. This supports our hope that much of the house: the straw, the wall covering, the roof will just disintegrate over time. The roof will rust (and already is) to failure. Granted, this will take 30-40 years and in the meantime we'll have a roof and some paneling with this rich brownish color. Forgive me, if I've written this in a previous posting but it's important to us. The plaster process has been amazing and taken much more time then Keith or I could have imagined. But, we are ready for color! I met with Ryan and Bob (Scottish plaster guy who seems to be as passionate about this as Ryan) and we decided on colors for all the rooms. This was really tough for me as it isn't as simple as putting paint up. Pigments are going to be ordered from Kremer Pigments in New York, mixed and applied. Ryan kept at me on this and had some samples, but had to continually say, "but it won't look like that." My imagination isn't that great, but I think we came up with some good colors. Ryan was able to make some sample tadelakt (the process we are going to use in the shower in the master bathroom). We are going to use the reddish/brown one for the shower and backsplash. Since last I posted, the snow has melted, the sun has shone and work has been progressing. A brief delay was caused when the doors were not ready for stucco. Builder Jeff wanted the jams in place so the earthen plaster/lime wash would curve around the doors. We aren't using any molding or baseboards (except in the closets where there is drywall and not a clean line between wall and floor). I did order them a bit late and the bad winter everywhere delayed shipments, but they arrived and Nicholas was put on the task of finishing them. Being an experienced woodworker, this took him half the time it would have taken me. We are using cherry doors upstairs and fir doors downstairs. This was definitely a cost issue. The doors are from Koch and supposedly "greener" then normal doors. Snow, snow, snow. For 63 days starting December 21st, we had snow on the ground. Our first snow closed highways, the airport, schools and businesses. It then proceeded to snow every weekend for about 6 weeks. The boys did what they could but it wasn't pleasant working weather. I must say, I'm going to be happy we had so much moisture when the flowers are blooming this spring and the reservoirs are approaching their full mark. Much better then anticipating a drought! 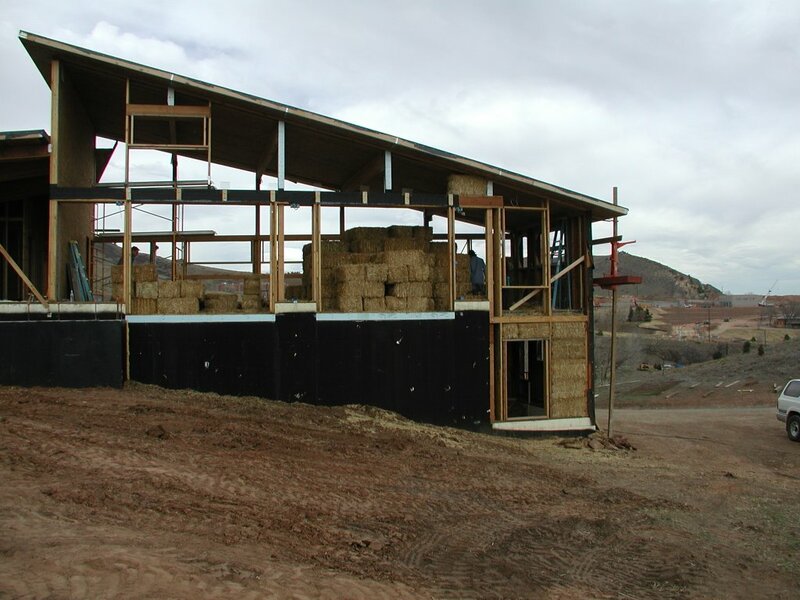 Our decision to build with strawbale, centered on its great insulating capability and the fact that 100 years from now, if the house is falling down, all that material is organic and goes back to the earth. My love of the strawbale walls was increased after the earthen plaster was put on. Ryan, our plaster guy extraordinaire, is amazingly talented. He is probably in his late 20s maybe early 30s, but seems like an old world craftsman. He loves what he does and gives the house soul. The base of the plaster is slaked (look it up) lime or gypsum mixed with pigment. We are hoping to use some of the clay from the property to color our walls. The thick walls covered with this beautiful mud has such a rich, warm feeling to them. Inspired by my friends Kitt and Barb, I am going to try to catch up with my blog and then keep it up until this project is completed. 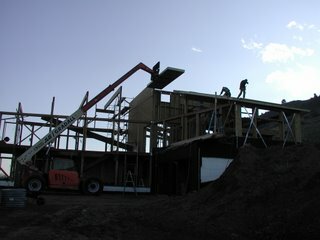 Luckily, documenting the construction of our strawbale home doesn't correspond to the actual construction of the house and the boys are making great strides. In a nutshell: the stawbale walls were completed the end of November; a clay coat of mud was put on the exterior; it started snowing so work had to move inside; the windows were installed; the interior walls have three coats of plaster; it was still snowing; the drywall was hung and taped; the rough electrical and plumbing were completed; the woodwork is now being sanded and finished; the interior doors are waiting to be installed; it's 70 degrees so work is now outside; the standing metal seam roof was installed; the one gutter and downspout was installed; more exterior plaster was done; and decisions about interior and exterior color need to be made. Oh yes, the kitchen cabinets were delivered in February, all the plumbing fixtures arrived and most the lighting is sitting in our very cozy basement. We have also been doing some research on concrete staining and hoping to complete that when Jeff (our very competent builder) gives us the word. Whew!! I'm exhausted and I don't really do any of this. My last blogging effort was a bit of a disaster. My good friend Barb, pointed out that the web site I listed for Ryan, our plaster guy took you to a Mexican photo shop. That is definitely not Ryan. His correct web site is: www.artesano-home.com. It is worth checking out so all of you will know how to plaster during the plaster party that will come after the big thaw. And, this is the strawbale crew. Perhaps I shouldn't do this while drinking wine. Oops, last photos didn't agree with caption. 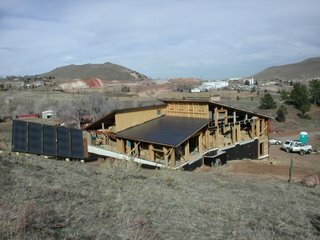 This is the back view with solar panels. A nice view of the solar thermal panels and the angles of the roof. It has been more then a month since my last entry and much has happened at the job site. 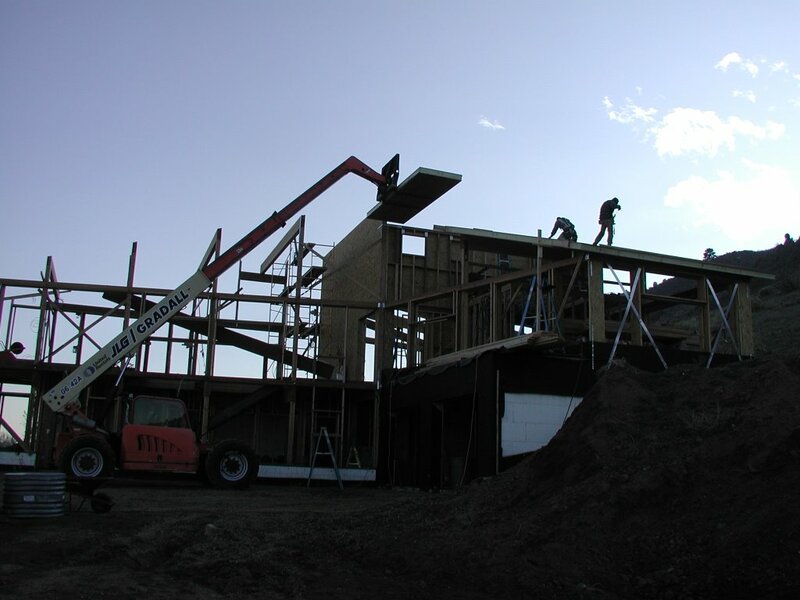 As October wore on and the cold nights of November and December loomed, the boys were busy working on framing on the second floor so we could "get weathered in." 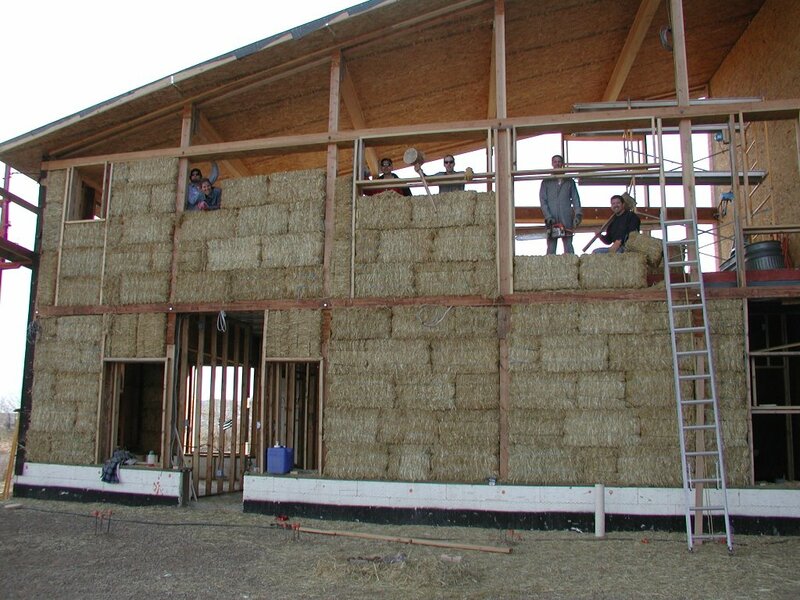 Much would depend on getting our roof panels installed, the straw placed in the walls and stucco on the walls. We were not encouraged when we had three snows within a 10 day period. And not just flurries, snow that had to be shoveled off the job site and out of all the box beams. Many calls were placed to the manufacturer of our roof panels to hurry them along. Not surprisingly every other homebuilder in the area using these panels was pushing to get them placed on their jobs. 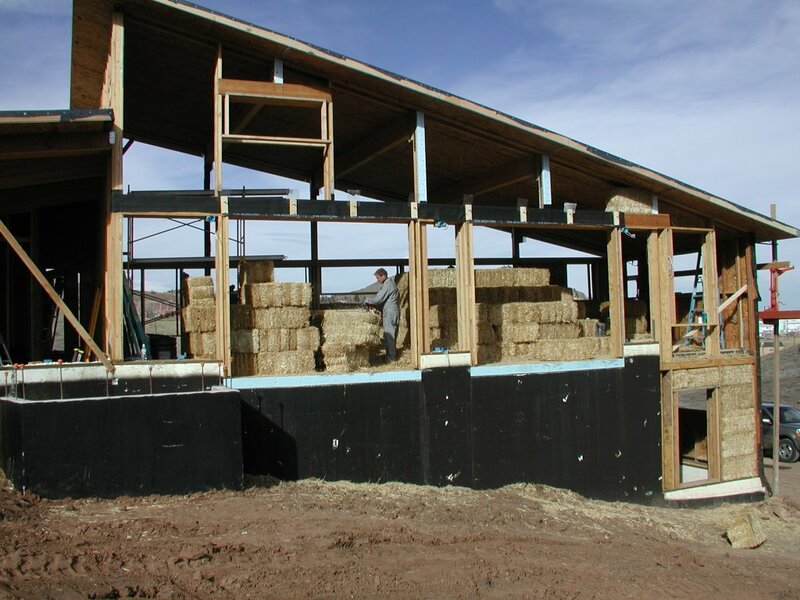 We decided to use SIPs (structurally insulating panels) for their insulative quality. For instance, a normal truss roof may have an "R" (the insulative quality of a material) of 8. The SIPs system has an "R" value of 42. The higher the number the more insulation. Finally, the panels were delivered as was the forklift to place them. It took 7 days to put them all in place. Watching Jeff and crew place them was like watching people put together a giant puzzle. 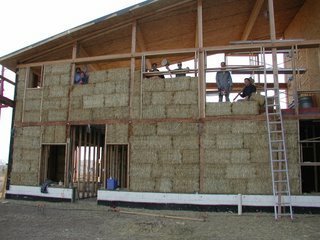 As the last SIPs were being placed, we stared moving straw into the house and preparing for our solar thermal panels to be placed behind the house. Keith had calculated how many bales were needed per room and we placed them accordingly. Keith, once again, recruited his amazing friends and a weekend was spent digging 12 holes for the caissons that would support our solar thermal panels. The panels were placed and on Friday, November 10th the strawbale stacking began. 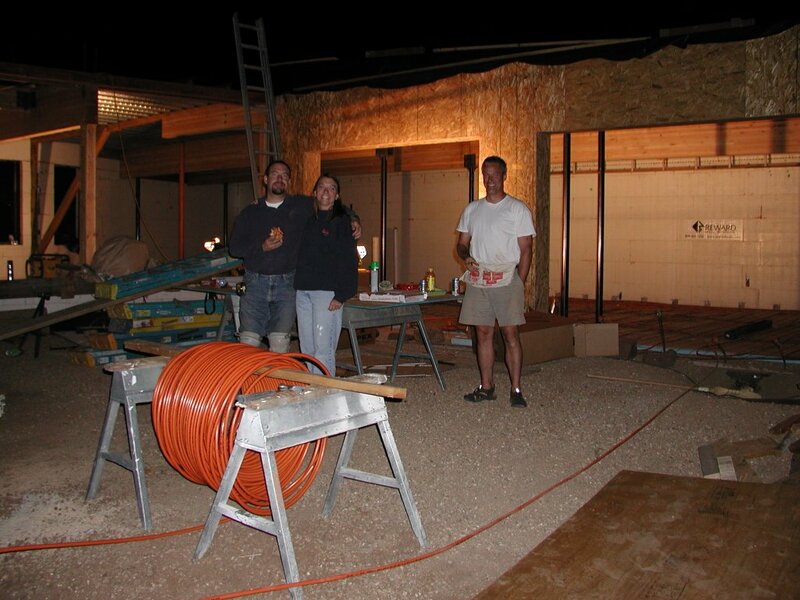 We were able to finish the basement that night and move onto the second floor. It is now November 20 and most the bales are stacked. The weather has cooperated for the most part. Wind seems to always be present but the moisture has been sparse. It is supposed to be 70 degrees tomorrow so we may try to spray on a layer of clay coating on the North strawbale wall. Ryan is helping us. You should check out his website (www.artesano.com) He is young but seems like an old world craftsman. He does beautiful stucco/earthen plaster work. This house has, in some ways, grown into far more of a project then Keith or I ever imagined. We had this vision of creating an earth-friendly home filled with good karma. Not to sound too cruncy granola, but we honestly wanted all our friends involved to give our home a soul. I am overwhelmed by the help that people have offered and gladly given. I'm sure all of you will be very glad when this project is complete, but I love seeing everyone covered in straw, laughing, bantering and filling our space. Thank you really isn't phrase enough to express the gratitude we feel. But, it will have to do until I can create a better phrase. After 10 glorious days in Greece, I have returned to a changed house. The radiant infloor heat was installed in the second floor, much of the electrical has been roughed in, much of the upstairs plumbing has been roughed in, the second floor concrete slab was poured, much of the interior framing has been completed and the stairs are in place with temporary treads. Now I do feel a bit guilty about being gone when all this work was being done (by Keith and all our friends) but I really don't see a need for everyone to be exhausted. And, I was doing important lime plaster research on the islands. More photos to follow but we're making a big push to be "weathered in" before, well, the weather. A side note: "anonymous" show yourself! While it may have been hard laying all the tubing for the radiant system, it was hard walking on all those cobblestone streets in Greece. AND, the water was really cold in the Mediterranean. Chuck, Mary and McKensie viewing "the pour"
OK, so I'm not a prolific blogger. The house is humming away. On Labor Day, while finishing dinner with Kenny and Kristi, Keith informed the group that we would be pouring the basement floor on Saturday, September 9. 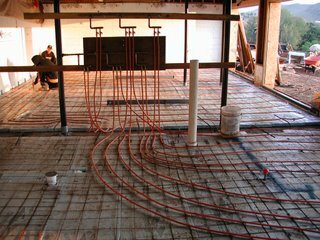 This seemed odd to me because I thought the radiant in-floor heating tubing had to be installed before the concrete could go in and there was no tubing to be seen. Well, it did and on Wednesday (after 24 hours of call and no sleep) I arrived at the job site and found Keith and Chuck standing in the garage discussing the two boxes of tubing sitting on the floor. 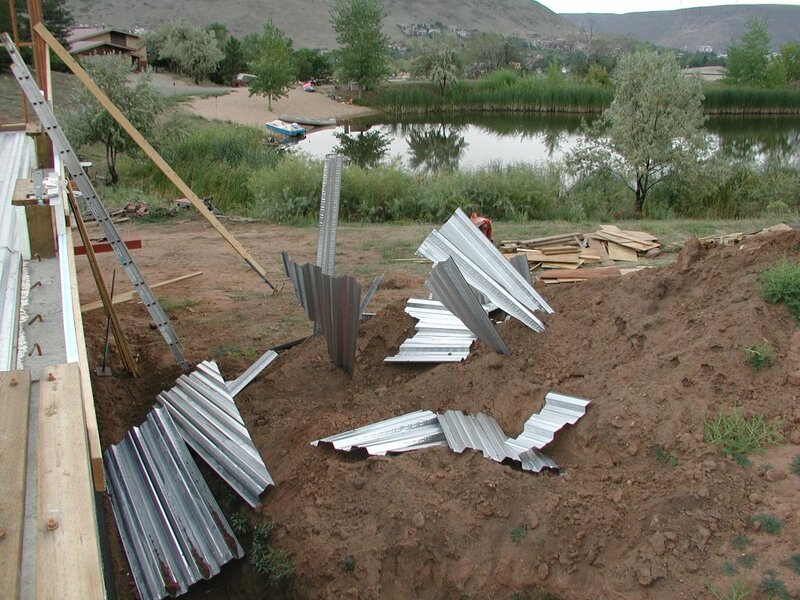 Now, some of you may think that two full days would be plenty to lay tubing in 1,800 square feet but the floor had to be inspected on Friday before the pour could occur. While I went home (to the basement) to sleep, Al, Ben, Nick, Chuck, Kenny, Kristi, and Mary joined Keith for a tubing layout fiesta. The work continued all day Thursday and by Friday night, the inspection had been done and the site was ready for the pour. 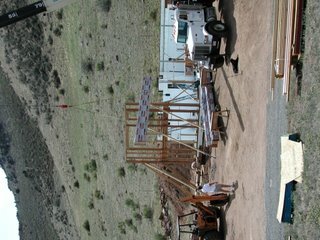 On Saturday, September 9, Roberto, Jesus and their helpers arrived a 7 a.m. and prepared for the first load of concrete. The pour was going beautifully until 11:30. Clouds were building, so Keith, John and I were on the second floor preparing a tarp, just in case it rained. At noon, the skies opened and we had the hardest rain that we have seen in some time. We had placed buckets on the glulams where we were concerned about drips. At one point, during the heavy 20 minute rain, the buckets were overflowing with water and creating lovely holes in the newly poured concrete. This may not have been as devasting if we were thinking, "hey, it's just the concrete, our hardwood/carpet/tile will cover all this." But, we are trying to minimize all finish work and were planning on staining the concrete. This rainsoaked and pocked floor was our finished floor. Roberto and friends never stopped working. They ended up staying until 4 p.m. and undid most of the rain damage AND didn't expect any extra payment. They actually said they would look forward to our next pour on a sunny day. During the weeks after the pour, interior walls have been framed on the basement level, some framing has begun on the second level, lighting has been decided and John, our electrician, has ordered materials and begun wiring. We (meaning Keith and the building crew) are feeling a bit of pressure to get the house "weathered in" prior to freezing weather. We have little control over this and I figure it will work out. In an effort to pretend like none of this is that stressful, I'm leaving on Wednesday, September 27 for Greece with my friends Barb and Alicia. I have no business going, but someone has. I'll be out of commission for 10 days and then vow to update this more frequently. It's Labor Day and the boys did labor. I went to the site with Barb (the woman who made me start this blog! ), showed her around, talked about the window details with Jeff, the builder, took some photos (soon to be downloaded) and went to lunch. The boys (Keith, Jeff, Ilan and John) spent time securing the structural steel pan on the glulams and completing some framing in the garage. While the steel pan will be filled with concrete when the slab is poured on the second floor, we are going to leave it exposed on the basement level. We have had a variety of responses to this idea, such as, "you're kidding, right?" to "no your not," to "maybe you could cover it with this." We have to constantly tell ourselves that it doesn't matter what other people think, they just don't know what is supercool! Keith informed me tonight that they are hoping to pour the basement slab on Saturday. 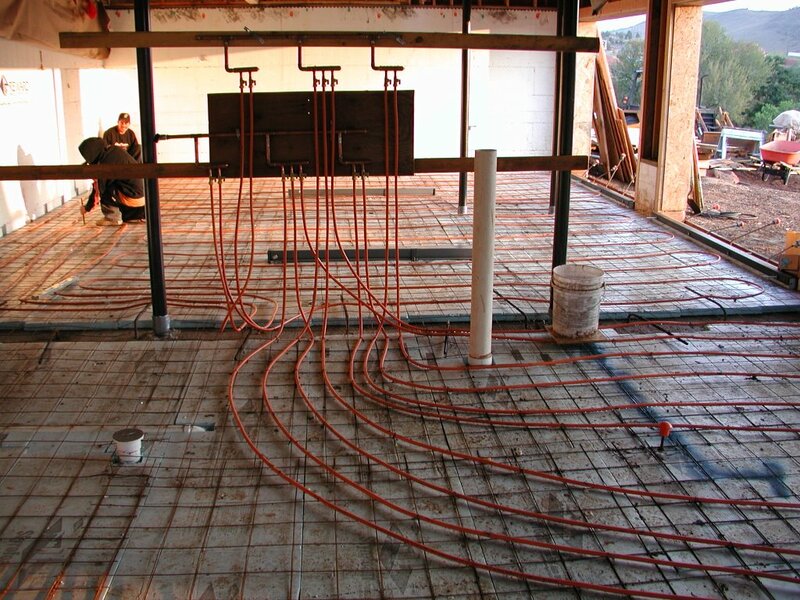 That means that all the tubing for the radiant floor heat must be installed by Friday. Roberto (the amazing slab pour-er) came by today and said he could do our job on the side with four workers and charge a little less, but it would have to be this Saturday. This doesn't cause me a great deal of stress because I'm just the lunch delivery person and the photographer, but I know the boys will be stressed. Ahhh, the joys of building. I am very happy we have decided on the radiant floor heat but it wasn't an easy decision. We are planning on a lot of passive solar gain for heat and having heating in your floor seems to negate that. We talked about doing a forced air system with solar thermal heating the air but neither one of us liked the idea of duct work and air blowing around. We have decided on an HVAC system that uses passive solar, 4 solar panels and a 560 gallon storage tank, a tankless domestic water system and an earth tube with an HRV (heat recovery ventilator) for ventilation. This discussion has been going on for about 4 months and finally, on a hike, Keith said, "this is what I think we should do," and I shook him by the shoulders and said, "for the love of Pete, please make a decision!" 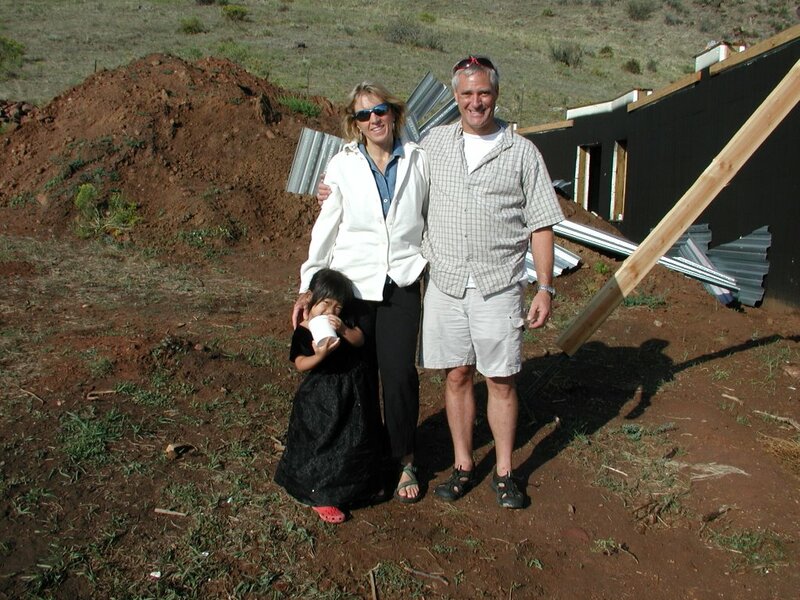 My husband and I are currently building a home in Golden, CO. Our goal is to build a home that impacts the earth minimally and used very little man-made energy. 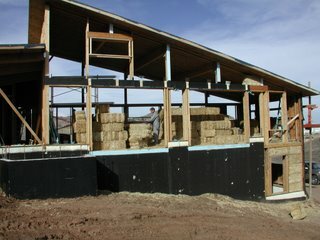 We are using insulating concrete forms and strawbale for insulation. We are trying to minimize volatile organic compounds by using finishes and raw materials that are environmentally friendly yet aesthetically pleasing.